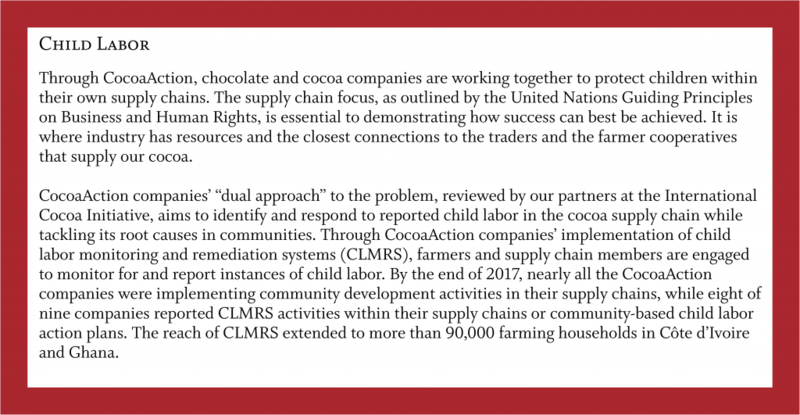 I am pleased to share with you the 2017 CocoaAction Data Packet Narrative, which explains the results obtained from last year’s data. Two years into implementation, CocoaAction remains a reference point for non-competitive collaboration on data and learning in the cocoa sector. 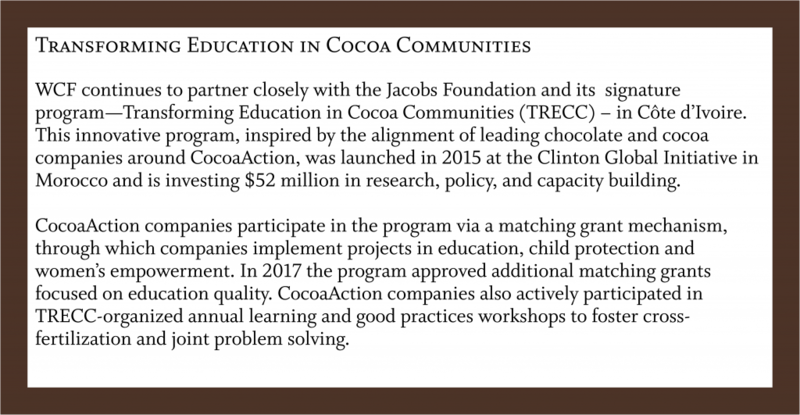 CocoaAction companies are implementing a groundbreaking collective impact strategy that is successfully building new partnerships among companies, governments, development partners, and civil society organizations to advance a common agenda for cocoa sustainability. The past year has seen market developments that have threatened to undermine longer-term sustainability of the value chain. With cocoa farmers earning less income, the welfare and resilience of cocoa growing households is less secure. Likewise, cocoa growing communities will likely have fewer resources to self-finance important community assets like safe drinking points and school management committees. CocoaAction is also yielding valuable insights on how sustainability efforts can be improved, while uncovering new challenges. We hope this data packet will provide data and a range of observations about what we have learned thus far through CocoaAction. The data is already serving as a catalyst for a wide-ranging review of CocoaAction that is looking critically at both the successes and shortcomings of CocoaAction and how these should be applied in today’s changing global environment. The review is also positioning us better to make any needed course corrections — many of which involve the Monitoring & Evaluation framework itself — as we continue to strive to achieve our vision of a cocoa sector where farmers prosper, cocoa-growing communities are empowered, human rights are respected, and the environment is conserved. We encourage open and robust dialogue about the information presented in this packet and look forward to hearing from you. 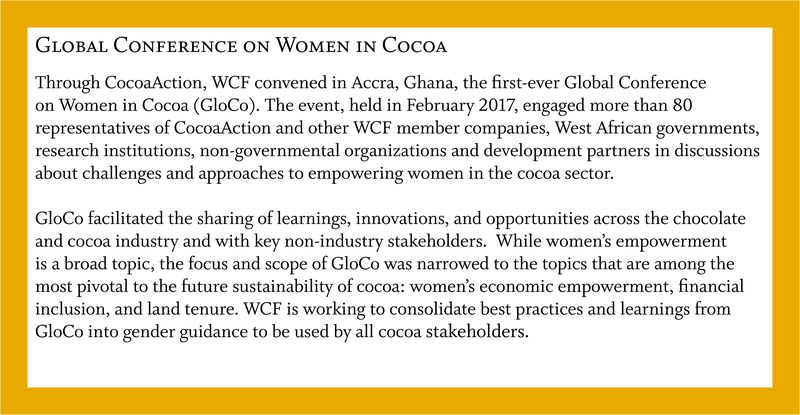 The 2017 CocoaAction Data Packet shares results from the implementation of CocoaAction in 2016 and 2017, while presenting related insights derived from the data and a critical assessment of the CocoaAction Monitoring & Evaluation (M&E) system. The focus in this report is on general trends and directional guidance that can be derived from the data. 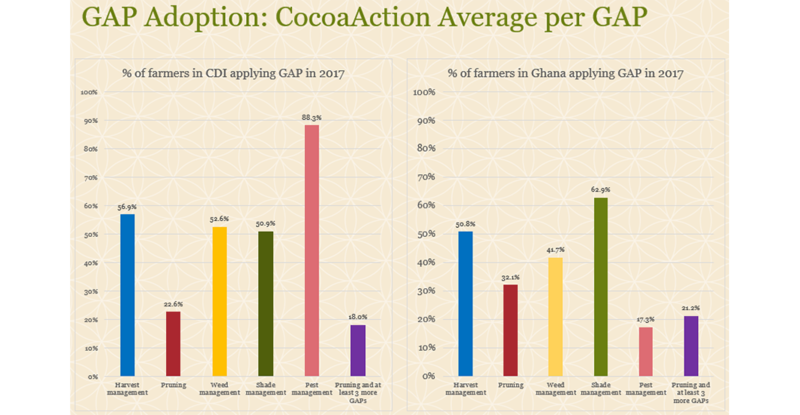 In 2017 CocoaAction companies reached 179,394 farmers (141,603 in Côte d’Ivoire and 37,791 in Ghana) with the productivity package, up from the 147,000 farmers reached in 2016. The overall target is 300,000 farmers adopting all components of the productivity package by 2020. The 2017 data indicates that there has been slow progress toward achieving the overall adoption target. 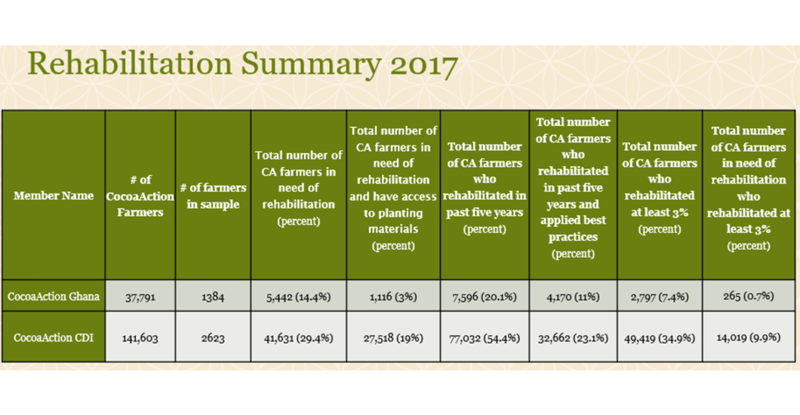 In 2017, nearly 5,000 farmers adopted the whole package. 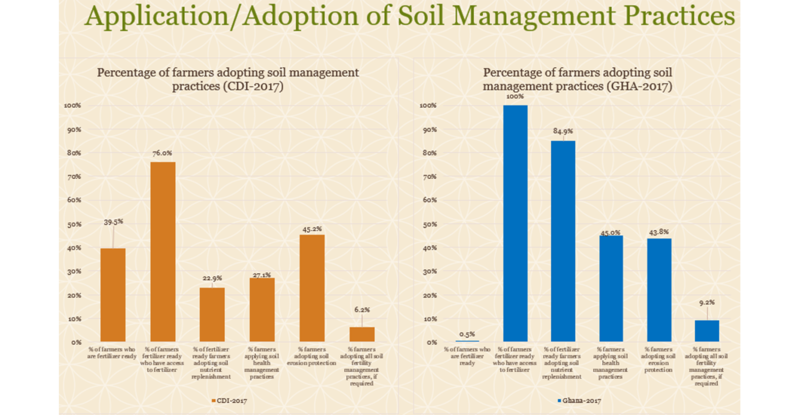 In Côte d’Ivoire, 18% of farmers applied 4/5 GAP including pruning, 9% of fertilizer ready farmers applied fertilizer, and 9.9% rehabilitated at least 3% of their farms. In Ghana, 21.2% of farmers applied 4/5 GAP including pruning, 0.4% of fertilizer ready farmers applied fertilizer, and 0.7% rehabilitated at least 3% of their farms. 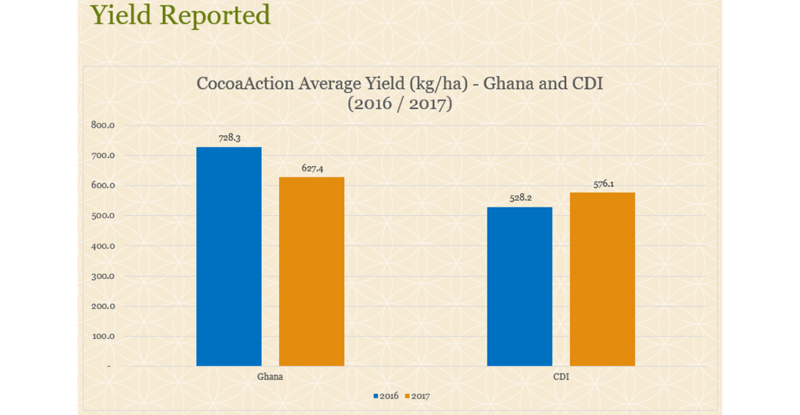 Average yield, which is self-reported by CocoaAction farmers, remains higher than the country average. In Côte d’Ivoire the average yield was 576 kg/ha and in Ghana the average yield was 627 kg/ha and in. The data collected suggests that of the productivity package components, applying fertilizer has the greatest positive effect on yield. Our experience shows that behavior change is at the core of a sustainable cocoa sector transformation. Farmers are encouraged and even expected to adopt multiple new farming practices to achieve a truly sustainable cocoa sector. Governments, civil society organizations and the private sector are also expected to change their behavior to create the enabling environment needed for farmers and communities to be successful. However, it is known that behavior change occurs in neither a fast nor easy fashion. Education and other forms of training alone do not lead to the desired behavioral changes and widespread adoption of new practices. 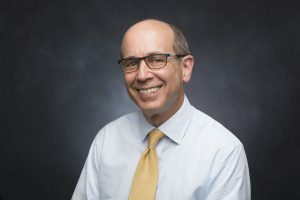 Economic, social, cultural, demographic, and psychological factors, as well as barriers related to land tenure, access to finance and policy, all play a significant role in determining behavior change. Notably, the low results for GAP adoption are sobering and highlight key areas for further learning and investment. 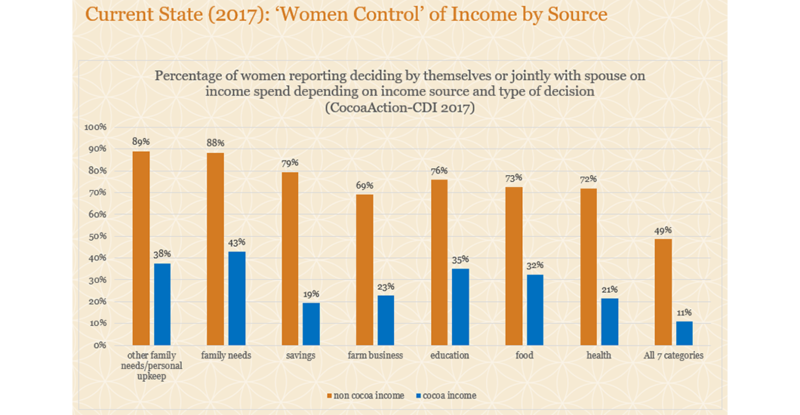 The experience gained through CocoaAction is increasingly pointing to a need for the chocolate and cocoa sector to understand behavior better, including its drivers, barriers, and the tools needed to support farmers to increase adoption. 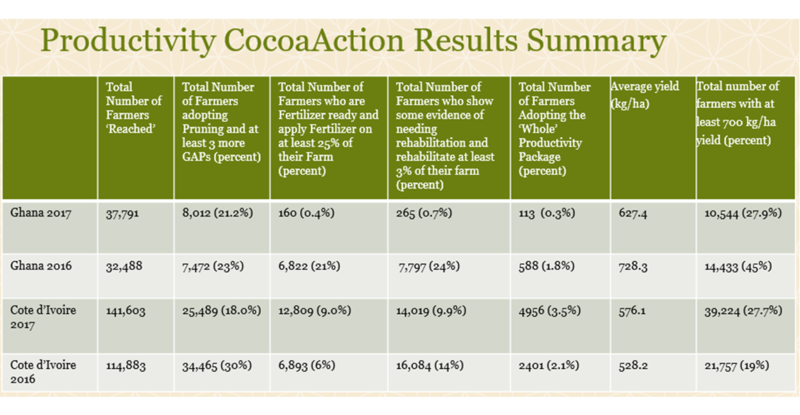 This learning has pushed farmer adoption and behavior change to the top of the CocoaAction agenda for the near future. 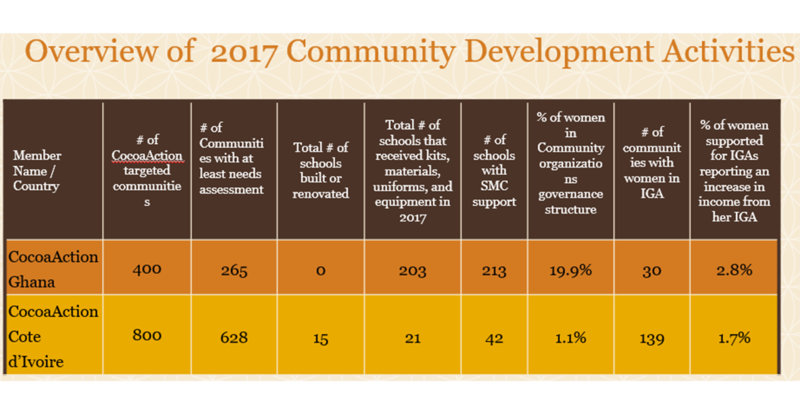 CocoaAction data from 2017 reveals that most of the nine companies are still in the early stages of implementing the key components of the community development package. Nevertheless, CocoaAction companies have completed 893 community needs assessments in targeted communities and it is anticipated that work will begin in earnest to implement community action plans (CAPs) in these communities in the coming year. On the community side, companies are making good progress toward the CocoaAction community development target by engaging with communities in conducting Community Needs Assessments (CNAs). In 2017, nearly 900 of total targeted 1,200 communities were engaged in CNA work. Now that CocoaAction has a wealth of information and insights into communities’ needs, implementation in the communities must be accelerated in partnership with local governments and civil society organizations. 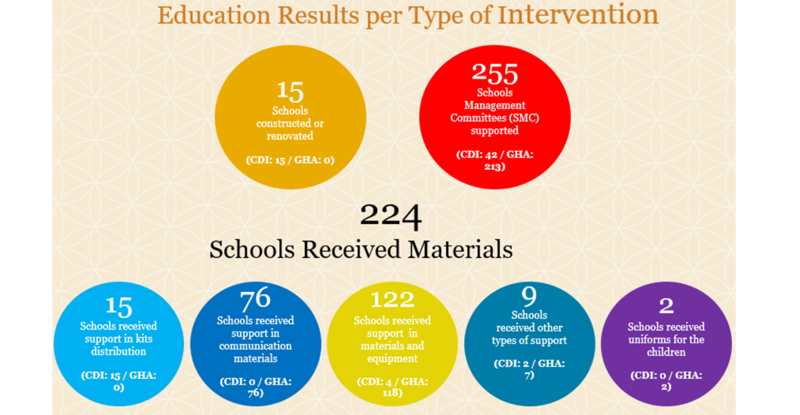 Finally, it has been observed that the CocoaAction companies are carrying out a considerable amount of impactful community development work with other development partners that is not reported through the CocoaAction M&E framework. Given that CocoaAction provides high-level M&E data collection guidance while allowing companies to work with their own data collectors, comparing data across years and across the nine companies is challenging. When CocoaAction started, companies were already working on their own sustainability programs. 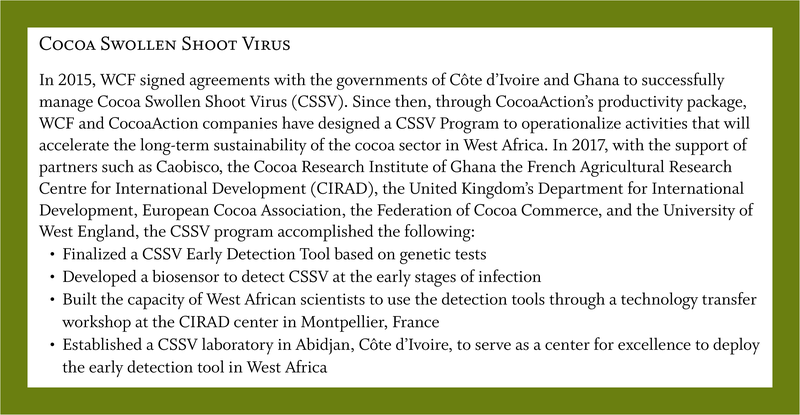 However, a baseline study, which could have provided a valuable mechanism for comparison and understanding aggregate progress, was not included as part of CocoaAction’s initial design and development in 2013-2015. The current M&E system does not provide for accurate data collection. For example, shade is assessed via a count of shade trees in the cocoa farm. This does not assess the extent and quality of shade. Too much shade cover can actually reduce yield, but in our current M&E system this would be rated positively. Another challenge is that some data such as yield is reported based on recall. Recall can lead to inaccuracies in data due to issues of memory. Qualitative data alone does not provide a rich enough picture of what is working, what is not, and why. Capacity building for data collectors and supervisors is known to be a critical and necessary component of a quality M&E system and therefore enumerator training will be strengthened and emphasized. The lack of a CocoaAction baseline and possible solutions will be explored further. All data collection indicators measured, the data collection process, analysis, and learning approach will be strengthened as we move forward. CocoaAction is a learning process, and we encourage you to reach out with questions and feedback. Please contact WCF via email. PricewaterhouseCoopers LLP (PwC) were appointed to provide independent assurance on our CocoaAction Data Narrative for the year ended 30 September 2017. PwC performed a limited assurance engagement in accordance with the International Standard on Assurance Engagements (ISAE) 3000 (Revised), ‘Assurance Engagements Other than Audits and Reviews of Historical Financial Information’, issued by the International Auditing and Assurance Standards Board, and in doing so, they applied the Institute of Chartered Accountants in England & Wales (ICAEW) Code of Ethics. PwC’s scope was to provide limited assurance over our processing and compilation of data submitted by the CocoaAction member companies in preparation of selected Key Performance Indicators (KPIs) presented in this report. The 2017 CocoaAction Data Packet Narrative contains PwC’s Limited Assurance Report, as well as a description of our compilation methodology, against which they assessed our preparation of the KPIs.